What is the best way to process a garlic stem? I, for one, do not understand your question. 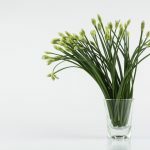 Are you talking about garlic chives or actual garlic stems? What kind of processing do you want to do?